Yet another year has come to an end and it's time for Year 6 to move on to the next stage of their lives in secondary school. But what an amazing year it has been! The children have had a year full of great learning opportunities, as you can see from our Class webpage below, and some fun along the way too. They have worked hard, developed their growth mindset, overcoming challenges and seeking still more as they know this is the best way to get better. Leavers Assembly was fantastic, if rather emotional for the children, their parents and teachers! We have had a brilliant final day with a pizza lunch outdoors and an afternoon of 'bubbles' in the sunshine. Hugs all around at the end of the day were special for all. I would all like to wish them all the best next year and onwards in their lives and look forward to catching up with all their news in the future. Year 6 have been working on some collaborative art during these last few weeks. By creating an individual and personal quadrant of a circle, a final piece of whole class circle art was created. Then the final results of the Year 6 Leavers Lino Cut print, organised by Mrs Hutchinson, was finally printed on Monday. Thank you Mrs Hutchinson. It looks stunning and a great reminder of their last class for all of the children to keep. Year 6, along with all the other KS2 classes have been enjoying taking part in a World Cup Football project with Wrexham Football Club this term. Last week was their last session and was an afternoon of Final Football Fun. Thanks to the staff from Wrexham Football Club for organising these sessions. Year 6 have been taking part in Kwik Cricket training over the last few weeks. Laura, from Flintshire Sports Development, has been working with the whole class and said what a 'fantastic group' they were, so focused and well behaved. The new skills learned have resulted in a team being selected for a competition taking place after half term. Year 6 have been problem solving and using their reasoning skills to explore ways to organise specific colours and orders of cubes in increasing sizes. This task required careful conversation and great perseverance and resilience as it wasn't as simple as the children first though! Investigating the bounce of a ball! This week Year 6 have been investigating whether the height you drop a ball from changes the height it bounces. They decided that they would need very careful and accurate results and technology was the best solution. So by filming each height drop test on an ipad, slowing the film down and observing the height very carefully, each group gathered a series of very accurate results. They also decided that by testing each height more than once and calculating a mean average, they would ensure the results were reliable. Watching in slow motion, they were also able to see the way the ball compressed on impact and expanded again as it pushed away from the floor. Great observation skills Year 6! On Wednesday Year 6 worked with Mr Williams of TechnoEd to learn about coding with the Crumble Coding controller. After a little input into the the way the block coding worked and how to connect the power and leads to the device, the children were away. They picked up the coding very quickly as they used transferable skills form coding in Purple Mash and with Lego WeDo. The children used sparkles, switches, created rainbow sequences of LED colours, controlled motors and wheels. After spending time exploring and completing mini challenges, the main challenge was to build a buggy and write a programme to get the buggy around a maze. This required resilience and plenty of perseverance as after each test, something in the code needed to be modified to improve the programme or debug a glitch. Now we were ready for our completion. After a random draw we 'played off' against each other until we reached our 3 finalists Georgia, Enrique and Daniel. After a first to 3 wins competition, Enrique was declared the winner. We observed that his spinner, which had smaller blades than some others, spun more quickly and more times on its fall and thought this was like a helicopters blades when it is flying. For our Whole School Science Day as part of British Science Week, Year 6 looked ahead to Sport Relief week and came up with the Big Question 'What makes a difference to how well we do sport?'. From this they explored all the different things they thought would influence this, finally chosing one to investigate. They refined their questions carefully to include the key aspect they were investigating and how they would measure it. After making plans, considering fair testing and reliability, the children carried out their investigation, problem solving along the way. For example, in one group where they were investigating whether taller people jump higher, the scientists were having difficulty reading the height of the jumps, as it happened so quickly. So, they decided to use an ipad to film the jump, then use the slow motion to read they scale for the jump height. Great problem solving using technology to improve accuracy! So far year we have been developing our coding skills using a range of programmes including Purple Mash 2Code and Logo. This week we had the chance to learn more about programming using Lego WeDo2. Working with Mr Williams, from TechnoEd, the children used iPads to access the software, following the step by step build instruction. They then learned the specific block coding to control ‘Milo’. They moved Milo, added sounds and developed the use of the sensors. They also videoed their progress to keep track of their sequences. Some groups even progressed to coordinating two WeDo2 Milos to move in unison and turn corners. This took great cooperation and coordination. Fantastic oracy skills were shown working with peer group partners. So much opportunity for reasoning, justifying, computational thinking, explaining, asking and answering questions….and of course it was great fun too! This week were very lucky to be able to take 12 of our Year 6 pupils to take part in a Lego Mindstorms Coding project yet again. This is the 4th year we have been invited by University of Chester to attend this event, run by PGCE student Technology teachers. 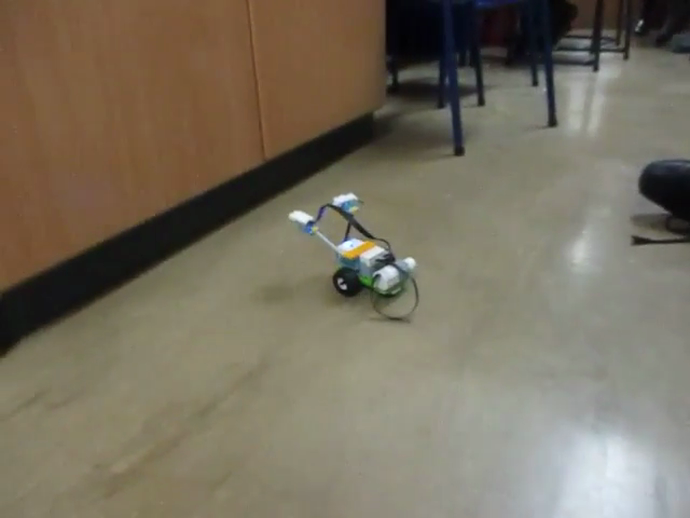 The challenge this year was to programme the Mindstorms Robot to use its sensors to turn, stop, slow and avoid objects (and other Robots) just like the Mars Rover 'Curiosity', which was the inspiration for this project . 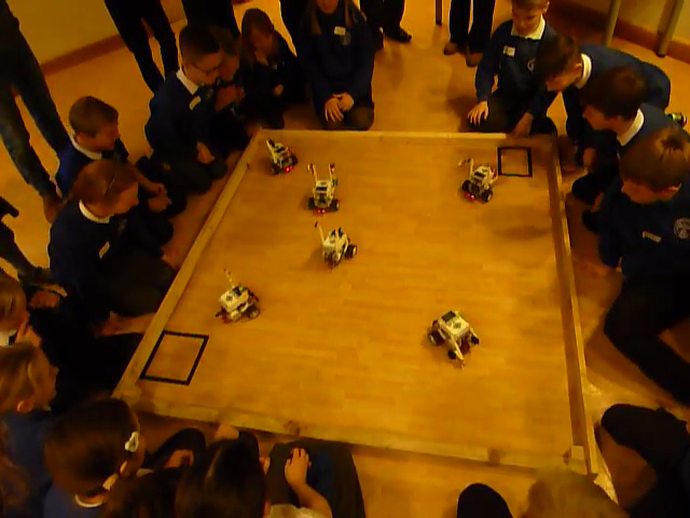 For each team of 3 pupils, it was their first experience of this particular coding system, but the children were able to use their transferable skills from coding work in school, using 2Code in Purple Mash, programming ProBots and working with Logo. The children worked brilliantly in their teams, listening to each other and sharing ideas to work out their code. 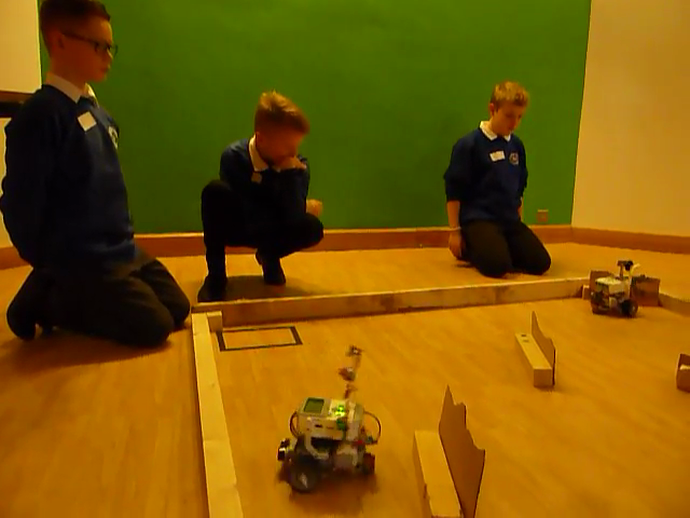 The final Battle Bot competition was great fun with everyone demonstrating that they had coded their Robot to avoid obstacles and move around the 'landscape' just like the Mars Rover. Well done to all! Today was the launch day of the Chris Evans 500 Words short Story Writing competition. We watched the Live Lesson this afternoon, joined in with the activities and even managed to get our school name included in the list given on screen near the end of the lesson. So what is 500 Words? Seven years ago, Chris Evans had a dream: to get children excited about reading and writing. All children, no matter what their ability. 500 Words is now one of the most successful story-writing competitions for children in the world: Three quarters of a million children have written a story for us over the years! Follow the link below to visit the 500 Words website. You can listen to and read stories from over previous years and explore resources to help you generate ideas for your own stories. Will you be one of the entrants this year? I hope so! Year 6 showed great perseverance in making their Christmas Cards this year, as they had to measure cut and fold very accurately and carefully in order to complete the task. The resulting cards looked stunning and I am sure the recipients will appreciate that they are all the children's own work! A few of the class also learned some new skills with some circle art using a pair of compasses for their designs. Well done to them too. Merry Christmas- Nadolig Llawen to everyone and Happy New Year - Blwyddyn Newydd Dda. Year 6 did an amazing job during the Christmas Performance last week, taking on many of the large speaking parts, learning and singing all of the songs and also being in charge of the music and images throughout the play. It was their last Christmas performance in Northop Hall and they certainly did themselves proud. We have a very long standing tradition at Northop Hall CP School of holding a Tree Decorating service each Christmas, where every child in the school makes a tree decoration and places it on our main school tree. From Angels to Snowmen and Snowflakes to Baubles, the children have worked so hard to make our tree special. Once all the decorations had been placed on the tree, we turned out the hall lights and turned on the tree lights! A beautiful 'Ahhhhh' spread across the hall as our special tree was illuminated. A story about a Christmas tree was told and a Christmas song sung to bring our service to a close. What a special time it was yet again this year! Well done to everyone for all the hard work making the tree look so amazing! Year 6 made Baubles this year, recycling plastic from pop bottles, using Posca paint pens to decorate and a paper spiral to finish it off. They looked stunning. Well done Year 6. Please find below the letter sent home at the start of last week with ideas for costumes for the Year 6 characters in the Christmas Play 2017. ​​Once again National Takeover Day has been a great success. The Year 6 children had responded to job adverts a few weeks ago and applied for the jobs of Headteachers, Teachers and Teaching Assistants, explaining why they felt they would be able to carry out the different roles. Once appointed, the 'new' staff members met with the current class teachers for planning meetings and spent two afternoons preparing plans and resources to use with their classes, using great teamwork, organisational and communication skills. Some even practiced story reading at home and continued their preparations. When the day arrived on Friday, the Year 6s arrived in school very professionally dressed, collected their new name badges and set up their classes for the day. There was much excitement, anticipation and a few nerves, but as always they lived up to our expectations and worked very hard with their classes. They were somewhat surprised to find that not all children 'listen' to their teachers or do what they are told all the time and that younger children finish tasks very much quicker than they expected, but with a little support and guidance these challenges were overcome. The Headteachers interviewed pupils and teachers, took photos, updated the school website and planned and delivered an assembly after lunch. ​All of the school staff said how impressed they were with their focus and skills. A fantastic group of National Takeover Day Staff! On Friday 10th November, Year 6 took part in a Remembrance Service at St Mary's Church and after at the newly renovated Northop Hall War Memorial. The pupils read their own poetry in the church and, once at the memorial, called out the names of the 'fallen' who are listed on the memorial before the two minutes silence. Viv Williams, co-founder of the Flintshire War Memorials website www.flintshirewarmemorials.com, who also contributed to the service, said what a credit our pupils were to the school with their thoughtful and moving poetry. Please click the link below to read the Year 6 poetry. Thank you to Reverend Richard Hainsworth, other members of the Church community and to the parents, grandparents and others village residents who attended the service. Well done Year 6. We are proud of you! Year 6 learned so much on their recent visit to Techniquest. From learning about Light & Sound during the 'show' to travelling through the Solar System and beyond in the Stardome, the experiences of the day came thick and fast. Working their way around the 'hands-on' science challenges and exhibits, the children showed their problem solving skills and perseverance & resilience too. A great day out! PC Ashton visited school today to work with Year 5 and Year 6. The subject for Year 6 was Drugs Awareness. The children had the opportunity to learn about the dangers of many illegal and legal drugs and learned about how medicines, and drugs like caffeine, nicotine and alcohol, can also be dangerous if not used in the right way and the correct quantities. We were learning about how drugs can alter your thinking, alter how your brain processes things and change how you think about the environment around you and the dangers you may face. The children had an opportunity to talk about the challenges they may face as they grow up with peer pressure being most significant. They also were introduced to the idea of stereotypes and not to always 'judge a book by its cover'! Thank you PC Ashton for helping us learn more about keeping ourselves safe and healthy in the future. 18 pupils from Year 6 have completed their Bikeability Cycle Training Course over two days this week. This important course teaches children about how to control their bikes safely and also teaches them about riding on the road using correct road position and signals. They are also trained how to be aware of the traffic and pedestrians around them. All 18 children passed their Level 1 training with the vast majority passing the much more challenging Level 2. The trainers did say, however, that those who didn't quite pass Level 2 had made considerable progress from a slightly less confident starting position than many of the other cyclists. Congratulations to everyone who took part, the trainers said how polite and hardworking all of the Year 6 pupils were. What an amazing time we all had at Nant BH this year! 35 children from Year 5 and Year 6, along with Mrs Williams, Miss Bellis and Mr Williams, spent 3 days at the outdoor centre in Snowdonia, battling wind, rain, some sunshine and sometimes their own fears, to climb, balance, canoe, slip and slide, zip wire and explore! Despite some 'challenging' weather we were able to take part in Gorge Walking, Canoeing, the Mid Ropes course, Zip Wire and Orienteering. Evening activities included hunting for hiding teachers to gather materials to answer questions and a Picture Review Quiz, where after finding questions hidden around the centre grounds, the quality of the answers about their Nant experience earned points! Our Year 6 School Council Reps have been elected! Already working hard in Year 6!